Welcome to my post on Sockeye City Grill, a waterfront seafood restaurant located in Steveston Village. Jess and I decided to try this restaurant while walking around the area as we knew there were several similar restaurants here. Sockeye City Grill had two patio areas, which we thought would give us a higher chance of getting a table earlier, so we decided to put our name down on their waitlist. Upon arriving, we were told it would be about a 15 minute wait for the patio, but throughout our half hour wait, it seemed this was the estimate they were telling every party that arrived. Despite there being several empty tables, they did not seat anyone there until much later, either due to lack of staff or slow service. They have a take-out window at the front of the restaurant as well. The patios were well shaded around 6pm on a very hot summer evening, with umbrellas at every table. When we were finally seated, there were 5 other empty tables around us. A server arrived after a few minutes to take our initial orders, but we were ready with the full order since we had ample time to look over the menu posted in front of the restaurant. 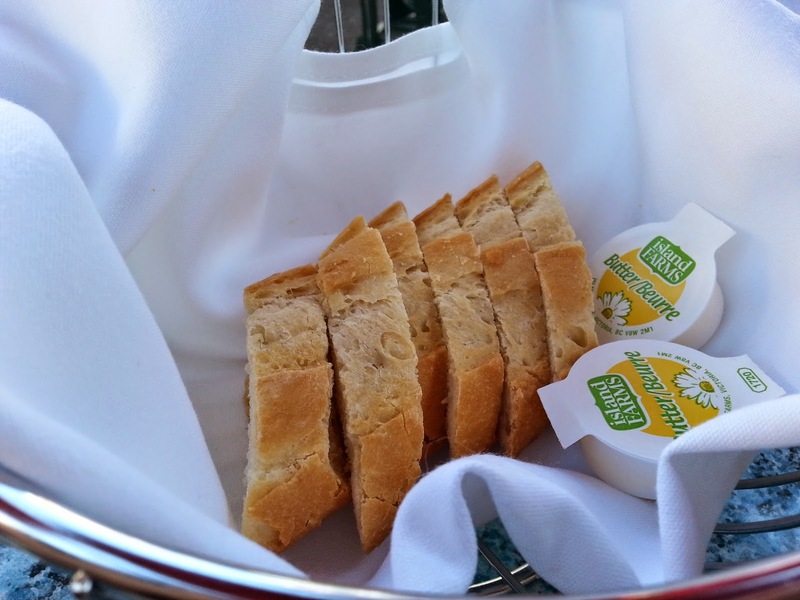 They started us off with free bread and butter, which are my absolute favourite thing to eat when it's free! We had this appetizer to start as we tend to order crab cakes often, so we wanted to see how well they did their crab cakes. The pan fried crab cake came with a mixed greens salad and charred tomato aioli on top of the crab cake. Yes, that’s crab cake singular, though it was larger than the crab cakes served at Dockside. The crab cake here had plenty of flavour and went well with the sauce provided. 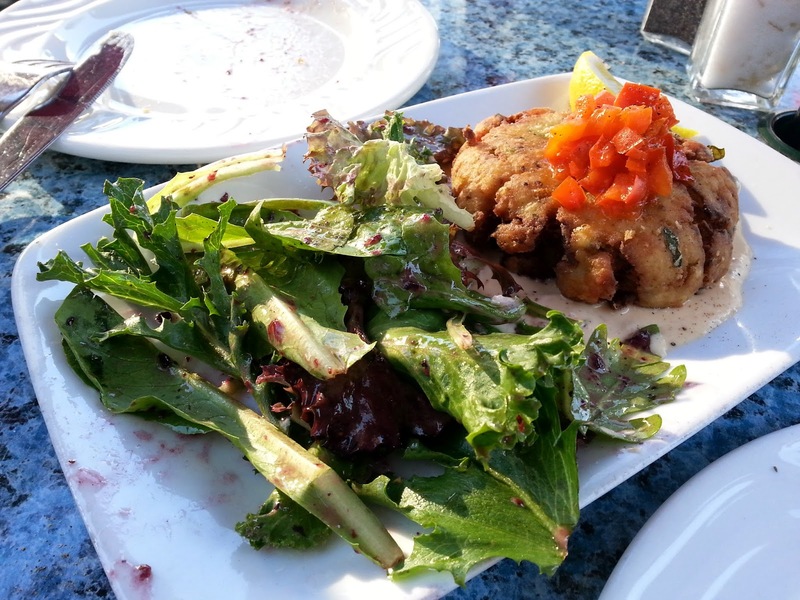 This was definitely a very satisfying crab cake, and with the salad, it made for a very good appetizer. The value of $12 for one crab cake and salad is a bit steep though, but considering the location of the restaurant, it’s justifiable. We each had the two piece halibut fish and chips, since we were in the area for some fish and chips, and their menu had claimed the fish and chips to be “famous”. Their website describes them as: “coated with home made beer batter, served with fries, coleslaw and our own tartar sauce.” I’m not a fan of coleslaw at all, so I can’t comment on that, but the fries were great when they first came out. After they cooled down from being out on the patio later on, they got a bit stale and I had to add quite a bit of salt and pepper just to get them to taste as good as when they first came out. The halibut was definitely amazing! 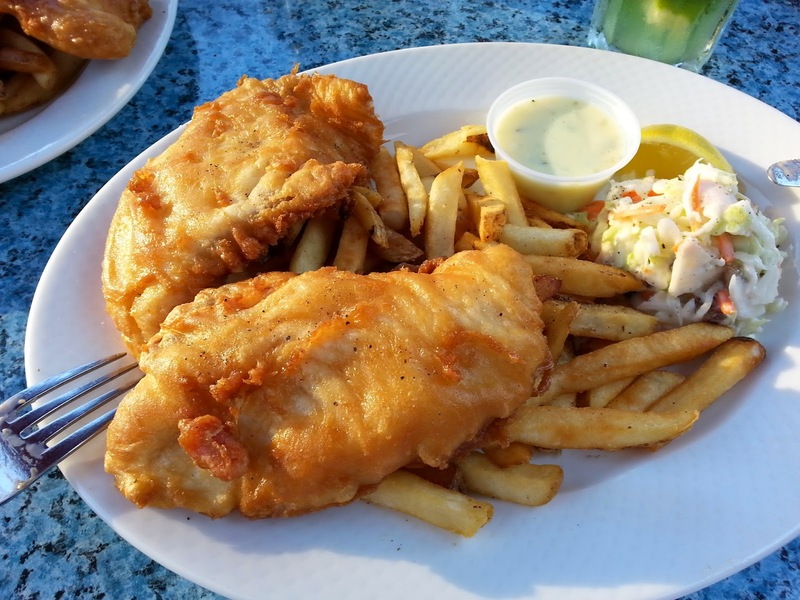 For the most part, the fish meat held itself together when being eaten with a fork, unlike some other fish and chips I’ve had where the fish meat just falls apart when trying to grab a fork-full. The fish was cooked very well with the beer batter coat being nice and crispy while the fish mean inside remaining soft and tender. The tartar sauce complimented the fish perfectly and I wouldn’t eat a bite without the sauce. The size of each piece of fish was much larger than expected, so only order 2 pieces if you are very hungry. Otherwise, 1 piece will do just fine as it turns out to be quite filling, especially if you’ve had an appetizer or two prior to the main course. The pieces do seem larger and more filling than the fish from Pajos. The flavour is also slightly different from Pajos and in my opinion, this tastes better! Their mojito was a lot greener than most mojitos I’ve had! The drink itself tasted great! It had copious amounts of mint leaves and lime slices and was very refreshing from beginning to end. It tasted like just the right amount of rum to not give off a strong rum taste, and the drink size was quite fair. 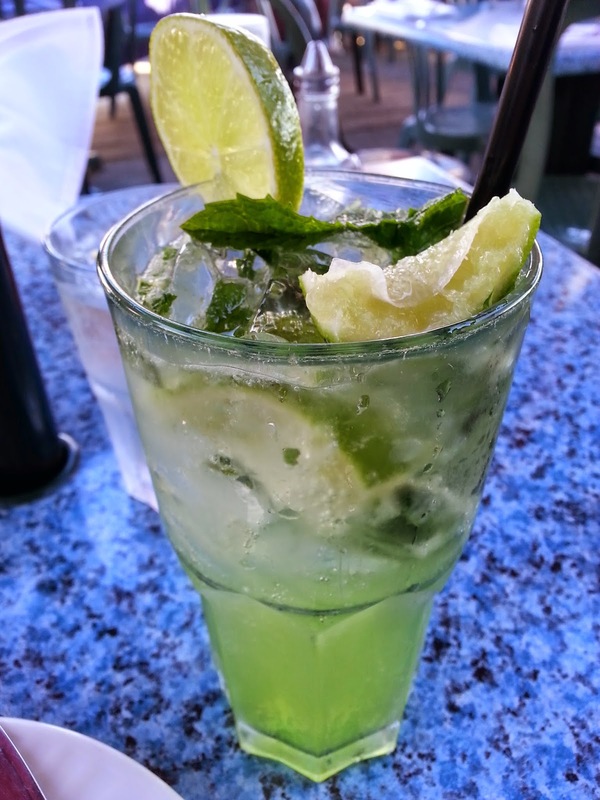 This would be one of the better mojitos I’ve had, and I would definitely get it again, especially at $6.45 each! The service was mediocre however. Our server was ok, but we noticed a table near us having quite the issue that caused him to leave before he even ordered food. Another table near us had their salad order messed up and they were very upset about it. The servers did not seem to be very empathetic as you would expect from restaurant servers. Overall, the food at this restaurant was good, but the service could use some improvement. I wouldn't mind revisiting this restaurant again but not any time soon, as there are several other restaurants in that area we have yet to try! 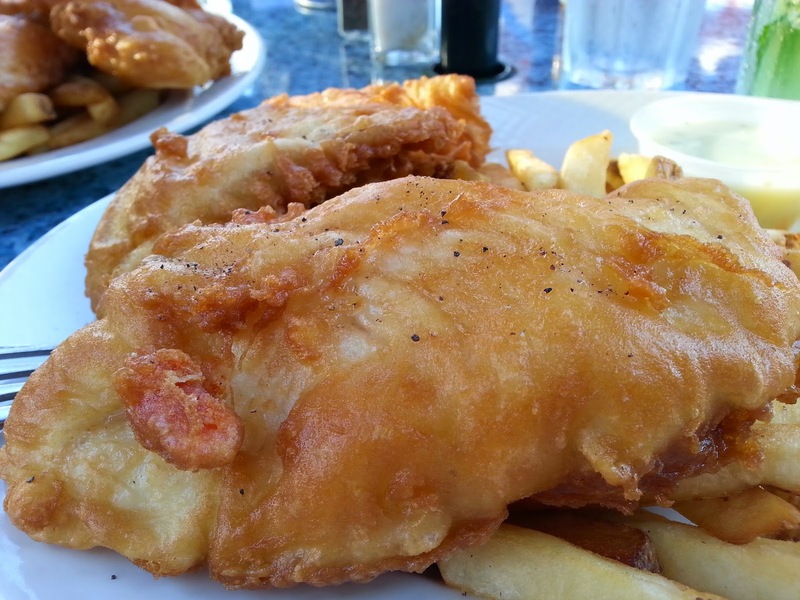 Thanks for reading and give this restaurant a try if you love fish and chips!